Cambridge Traditional Freestanding Slipper Bath - Only £429.99! In stock now for just £429.99 including VAT! Hurry while stocks last! The Cambridge Traditional Freestanding Bath boasts a stunning classical and timeless look that will be the envy of your neighbours. Built to the highest standard and crafted from the finest, most durable materials, this bath offers a perfect blend of style and substance. 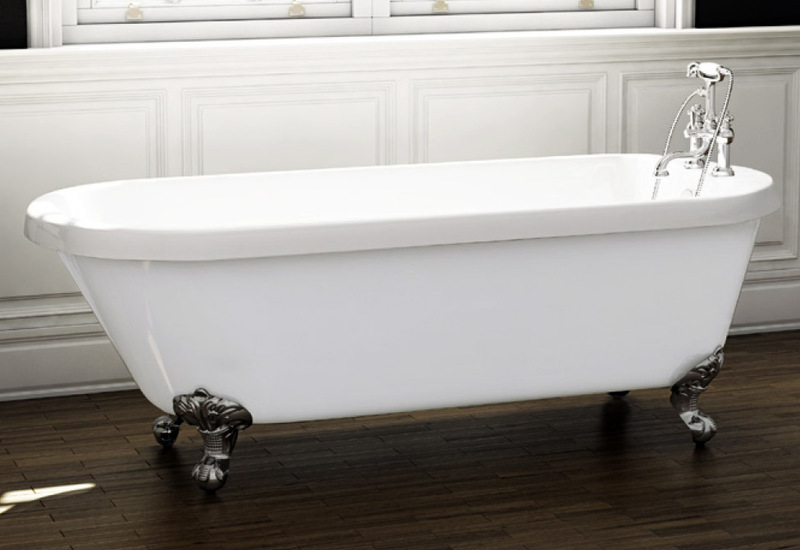 Known as the epitome of traditional styling, this bath would be at home in any bathroom. The Cambridge bath is the ideal place to unwind, relax and let your cares slowly drift away. This beautiful bath is available in a choice of two sizes, with the classic chrome ball and claw feet pictured - please make your selection from the drop-down menu at the bottom of this page. This stunning freestanding bath combines tradition with modern practicality, offering the best of both worlds. Noted for its stunning, eye-catching and stylish looks, this Traditional Freestanding Bath Range draws inspiration from Victorian style antiquity, resulting in a timeless and memorable appearance that will be the envy of your neighbours. Sold with beautiful Chrome Ball & Claw feet, this regal bath would be at home in any traditional bathroom, providing an eye-catching centre-piece for your room. The bath's classical features are complimented by a highly effective and modern construction - built in a fine, high-quality acrylic finish, this traditional bath will be durable and luxurious for years and years to come. The bath is manufactured from two 6mm thick acrylic sheets which are then bonded together with Cast Resin Stone and Fibre Glass. This gives the Cambridge Traditional Freestanding Slipper Bath truly excellent heat retention, allowing you a luxurious soak for a longer time. The smooth, sleek acrylic surface also makes the bath exceptionally easy to clean. This item includes the Chrome Ball & Claw feet pictured above, and is available in a choice of two sizes - see menu below.